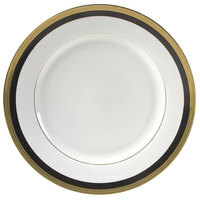 10 Strawberry Street Sahara porcelain dinnerware features a black and gold striped rim that provides an excellent frame for your food, accentuating its colors and appeal. 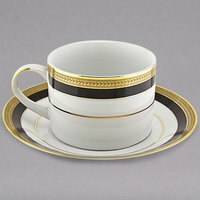 These elegant plates, bowls, and cup and saucer sets have a sophisticated look that is ideal for use in upscale restaurants, contemporary bistros, and banquet halls. Additionally, several pieces in this set feature rolled edges, giving them a deep bowl that is perfect for serving wet or saucy food like pasta or salad with dressing. If you’re looking for bright and visually appealing dishes for your fine dining establishment, 10 Strawberry Street Sahara porcelain dinnerware is an excellent solution. With a stunning gold and black rim, these products provide a frame for your food, highlighting its appeal. 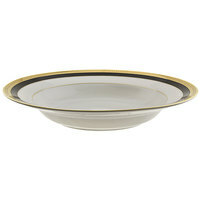 The pieces in this set also come in several sizes, so you can find the right option for serving any kind of food. 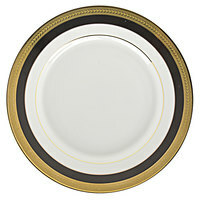 Additionally, this dinnerware set is made out of bright and durable porcelain that is resistant to stains and chipping. 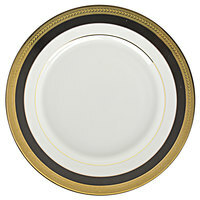 For more tableware, check out our beer glasses, wooden display platters, and stoneware plates. If you're wondering where to buy 10 Strawberry Street Sahara porcelain dinnerware, we have a large selection of 10 Strawberry Street Sahara porcelain dinnerware for sale at the lowest prices.